Will be adopted as national flag of the country one of silk or linen eight foot long by six broad, divided by diagonal lines in four fields, white the two extremes superior and inferior, and flesh-colored the lateral two, with an oval-shaped laurel wreath, and within that a sun setting over snowed mountains above a quiet sea. The shield can be painted or embroidery, but preserving each object their colors, to know: the laurel wreath to be green and tied in the lower part with a ribbon of gold color; blue the upper part that represents the sky; yellow the sun with its beams; the mountains of an dark brown color, and the sea between blue and green. Source: American Hispanic Encyclopedia; the blue color is applied to the snowfall mountains as reflex of the sky. Ratio 6:8. It was created by General José de San Martín, Liberator of Peru, Chile and his native Argentina. In September 8th, 1820 when General San Martín arrived to the port city of Pisco with the Libertarian Expedition, he saw a flock of flamingos and they inspired him the colours and design of the flag. The coat of arms, similar to the Argentinean Republic, shows the Pacific Ocean, the Andes and the sun of the Incas and it is surrounded by a wreath of laurel. Red symbolizes the blood of those who fought for freedom and white stands for justice and peace. The flag was introduced in 1825. Its designer, Captain General José de San Martin, was inspired by a number of flamingoes in flight, which he considered to be a good omen, and he designed a flag in red and white for his Peruvian Legion. This flag is repeatedly refered to as Peru’s first flag, created in October 1820 — but what about the earlier one, from May 1820, the blue one with a yellow Sun on it? Various South-American newspapers, for instance El Comercio, have reported the theft of an historical flag of Peru in the local museum of the town of Huaura, located 150 km north of Lima. The flag seems to have been stolen without breaking and entering the museum. The crystal urn containing the flag was not broken either. The flag is supposed to be the one hoisted by the Argentinean General José de San Martín during the first proclamation of the independence of Peru in Huaura, 27 November 1820. The authorities are investigating wether the stolen flag is a replica of the original flag, which was already stolen in 1985 by members of the armed group Movimiento Revolucionario Túpac Amaru and retrieved two years later. NoticiasTrujillo.COM reports the widely known origin of the colours, a number of flamingoes in flight, which San Martín considered to be a good omen, and proposed an alternative explanation, a combination of the red colour from the Chilean flag and the white colour from the Argentinean flag, to honour the Chilean and Argentinean members of the liberation army. In a special ceremony, police officials handed the flag to President Garcia. Later it was hoisted on a pole on top of the Government Palace. Hopefully someone will keep an eye on it now. Obviously Peru’s National Cultural Institute will be in charge from now on. «For the second time on 20 years, the Peruvian police returns to us our original flag, the historical flag that San Martin imagined at the beaches of Pisco when following the infinite flight of flamingos», Garcia said. The flag was stolen from the top of Huaura’s Independence museum. Police sources said the flag was recovered in a house located in Miraflores’ residential area and two suspects were arrested who tried to sell it to an antique dealer for several thousand dollars. This flag, at this Billiken website page, is a rendition of the first flag of Peru, but does not look exactly the same as the others. 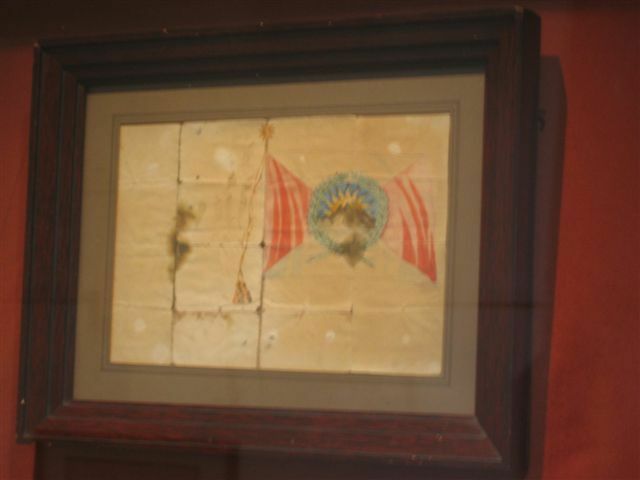 This is the original drawing of the first flag of Peru done by none one than other that his creator; Don José de San Martín. The original drawing of the first flag of Peru can be seen on the National Museum of History, one of the Crown Jewels of the Museum. It is very small since San Martin keep his original drawing folded inside his pocket as obviously seeing by lines that the folding have left on the on the paper. The Peruvian Ensign in the British Admiralty manuscript flag book of 1845, now in the British Royal Naval Museum Library, Portsmouth (see page of the museum website), is similar to this image. It is strange that, although the stain paper image is known to be the creator’s own design, so many variant depictions have popped up. On 29 July 2006, RPP Noticias (Lima, Peru), reports the restoration of the oldest known Peruvian flag. This flag is the same as the one hoisted for the proclamation of independence in Piura in 1821, and was designed by General Don José de San Martín. The flag has been kept by the Museum of National History since 1916; it is today in a very bad state. The restoration shall take three months, after which the flag will be exhibited only in the most important events. According to the photography in RPP Noticias, the flag is undoubtly of the San Martin’s pattern, and has to be compared with other renditions shown here. The Museum flag seems to have as the central emblem a big sun and no mountain as the other renditions of the flag have. Moreover, it has (apparently) an open wreath. This flag on display at the Fuerte Real Felipe museum in Callao, near Lima, run by the army. We have other slightly different versions of this same flag. Perhaps we should put up a gallery… I’m ready to bet that the photo depicts not the original flag but a much later day cloth reconstruction displayed in a Museum for worship and not for scholarship. I believe that this is only one of the versions of this flag. All versions known are close but not exactly equal, surely because the original flags also were slighty differents. The rendition of the arms in early XIX century was not standarized and they were embrodoined mainly from writen heraldic description. The flag at this Peru.COM page is quite different. This is the only version to show an open wreath.